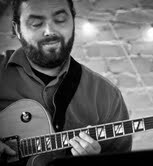 Daniel Mandrychenko is a multi-genre guitarist that currently resides in the San Francisco Bay Area. A Cal State East Bay grad, he is an active member of the area’s jazz community, and has played at almost every major venue in the Bay Area, including Yoshi’s Jazz Club, Brick and Mortar Music Hall, Bottom Of The Hill, and Savannah Jazz Club. Daniel has also performed as a member of various groups as a part of the San Francisco Jazz Festival, Next Generation Jazz Festival, and Reno Jazz Festival, among others. He has shared the stage with Dave Liebman, Marcus Printup, Brad Leili, and Charles McPherson. The young guitarist has been an active member of the Bay Area music scene since his early days of high school, playing in the SFJAZZ All-Stars and other honor groups throughout the Area. He has also toured the Western United States with his own rock band. Daniel is an avid educator. He stresses technical understanding as well as developing the skills to play the music you love. Paul started studying guitar and music at the age of 11. He started his formal training after high school and studied with some of the best in the area. His guitar instructors include Brian Pardo, Danny Caron, and most recently Richard Savino. Paul also has been trained as a bassist, both electric and double bass. His instructors include Shahien Shahkar and Rashid Alta. Paul also has a great deal of experience in performance. He has played in many big bands, orchestras and jazz groups. He was the staff bassist for North Hills Christian Church for 15 years and the staff bassist for Listen and Be Heard Poetry Cafe for 2 years. He is currently playing with a traditional Irish Band known as “Blame the Whiskey”.